The first column is what we have, then our goal, then what we need. The final column is the percentage we are towards the goal. We've already reached our goal for vacations this year - by the number you can see that we're not doing whole lot of camping or any kind of other vacation. Because we're directing so much cash to our back yard project, we're only committing to stay-cations. A question for you though - have you ever told your family that you're cutting back on expenses that will affect how you traditionally celebrate their birthdays, or other holidays, and how did they react? We told our families back in January about the changes to our budget - so they wouldn't be surprised. It seems that some are taking it more smoothly then others. With some asking us to 'find a way' - which I'm not sure that we can. Jordan is very confident in our decisions, and so am I - but it's difficult when you're family doesn't get on board with you too. ...This is why emergency funds are important. I have talked about it in passing on a few posts over the last few months, but I have yet to dedicate one to our big, backyard project this year. Starting in May (depending on frost), we will be contracting out the building of our fence, garage and deck. We've been doing a lot of research to find a contractor that would be the best fit for us and we've finally settled on one that will be the right choice for us. They have excellent references, and the most cost effective builder in our town too! It's a large sum of money. Whoa, is it a large sum of money. 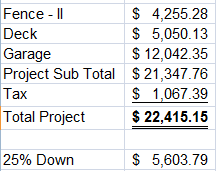 After 5% tax we have a grand total of $22,415.15. I am however so proud, that Jordan and I have come up with a plan to pay for the project, almost entirely in cash. Here is a break down of where the money is coming from. So - where is it all going to come from? A lot of sacrifice and compromise. 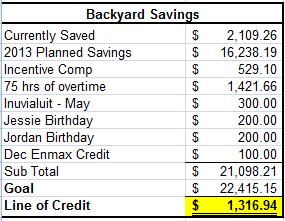 You might remember from our 2013 budget post, that Jordan and I have scaled back our vacation and other planned savings/spending categories in order to maximize how much we have for our backyard project. We realized just this month after some quotes came in with 2013 pricing, that we hadn't made enough compromises in our first budget for the year. So, we have made two major changes. We have stopped our allowances for the remainder of the year and cancelled my participation in my work's share purchase program for the rest of the year. These two changes ($100/pay for shares and $25/pay/each for allowance) result in an additional $2,700 towards the backyard budget. The next most significant change is my pay. My supervisor has advised me of a pay raise this upcoming April. I don't have 100% confirmation - but am confident that my new rate of pay will be approved. I have updated our budget to reflect that new rate of pay, as well as accounted for the adjusted CPP&EI contributions (which will now stop in September rather than October). Overtime - I have 75 hours of overtime in the bank that I will have paid out in a couple of months. The sum is not the same as my regular pay because of an increase in taxes payable - but it's nothing to sneeze at, that's for sure! Incentive compensation is a bonus (of such) for share ownership - I expect that payment in March. So, after all of that - we're going to be about $1,300 shy. There it is - The Big Backyard Project. A couple of things happened this week. I got venomously p*ssed off that someone in my neighborhood stole 5 bags of deposit based cans/bottles off of our front porch. I got frustrated that I was relying on the estimated $60 worth of recyclable money to go to a work function this weekend. Jordan and realized that we don't manage our day to day money as well as we could. So...how are all of those things related? Booze. Not all of the garbage bags were alcohol, but a fair number of bottles/cans were from beer/spirits. Of course, we can also return milk cartons and the like for a refund as well. Once I have a garage, things like that will be kept there..not on my front porch. 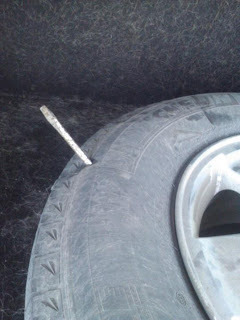 I was frustrated for two reasons 1. someone stole. 2. money. I'm going to focus on the later of those two points. The last two months have been very hectic - we have had guests stay over, or been guests for someone elses get to gether, had cab fair, a work function - or some other such thing every week - sometimes twice a week. We pride ourselves on being good hosts, and good guests - and so we are a bit behind on our day-to-day spending...supplementing with our credit card. We've caught it before it's gotten too bad (only owe $200) - but it's like a pay day loan to ourselves. Each week, we pay ourselves back, and then start the next week with less money in our day to day account. I was counting on that to help us get back out of our little hole we're in, and go to a work function this weekend - turns out that's not going to happen. Then I realized, that it is absolutely ridiculous that I was relying on pop bottles! Seriously. Jordan and I make over $114,000 a year (gross) Pop Bottles! So..I told Jordan about this realization and how annoyed I was. The topic changed gears, and went back and forth a few times - but we realized two things. We don't plan for entertainment/parties/socializing in anyway. We drink just about everyday - just the two of us. Now, don't get me wrong. We'll have wine with supper, or a couple of beers after work - but that is seriously adding up. We also like to have a well stocked bar for our guests. You can see in 2010 our average monthly spending on alcohol was pretty crazy, then in 2011 we got ourselves sorted out. Ever since then, it's been steadily creeping back up. So. What are we going to do about it? We have pledged that for the month of March, we will not drink when it is just the two of us. Instead, we will save that money and use it if/when we go out with friends - whether there is drinking or not. The intent behind this is two fold. One, we will have the money to spend time with friends instead of wasting it on personal consumption and doing so without just adding more money to our day-to-day spending account (an idea that came up, and we both tossed out). Two, we will be healthier. Drinking in moderation is a much safer and healthier route. Just for fun, we weighed ourselves this morning, and will again in a months time - to see if we also lose any weight. It's hard to believe another month has slipped by again. I can feel that spring is coming. The days are brighter, longer and the snow is almost gone. With spring around the corner, we are getting closer to our big backyard project - so you'll start to see a lot of our extra funds being direct to our house fund account. Our Networth with spike, and then drop, as we spend it. Here is a summary for where we are at today. RRSP's & Pension have gone up as per normal, as has my shareholding with my company. Savings has also gone up some. You'll see the balance of our day to day spending account, as well as our 'workhorse' chequing account (less $1,000 buffer which is included in our emergency fund). Liabilities have also steadily gone down - we actually own 3% of our house now - pretty exciting! I'm really looking forward to next month when the amount owing on the Escape doesn't start with a '2' any longer. Check out my historical networth on the right hand side of this blog.